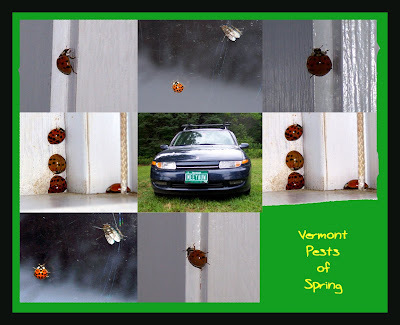 Cluster flies and Asian Lady Beetles (click here for my posts) are reappearing now that the sun is stronger and the windows warmer. And the car has a broken rack and pinion. How much will that cost? The entire cost of the camera that I have been saving for during the past eighteen months. I am reacting much stronger than I ever thought possible. My camera is my only enjoyment in life (sad, huh?) and I am devastated. Damn Saturn cars. The car has been a disaster and a hazard ever since I bought it. I can't even afford to get a Subaru because I have been buying $400 of heating oil a month. We're running a travel piece on Vermont featuring St. Mary Star of the Sea Church for New York Magazine’s website. I found your blog through Google image and your photos might work for the piece. Would we be allowed to use your photos? As a rule, we include photo credits. I'm under a bit of a time crunch, as my deadline is Tuesday (2/26). If you have any questions feel free to write back to me here or call me at 212-508-0718. I'm so easy. I called Maura immediately to confirm she was a person and gave permission for the magazine to use the photos. Then I e-mailed all of my kids and told my digital photography class. I gloated. Maura warned me that they may not use the photo. Well, they didn't. They didn't even publish when she said: the article came out a few weeks later. And it wasn't about St. Mary's. It was about Jay Peak. It was pretentious and condescending (aren't those symptoms of anger and hostility?). New Yorkers who vacation here already have a pretentious, aggressive and condescending reputation to live down. The last paragraph of the article: "The Chronicle, Orleans County’s weekly paper, offers local art-gallery, museum, and yoga-class listings and unparalleled glimpses of life in the Kingdom (recent headline: “Arland Macie knows how to run a wheelbarrow")." I have all the old Chronicles (our weekly newspaper) but I don't remember that article. Anyhow, I get the creeps when people get chuckles at the expense of other people and their lives. I'm glad they didn't use my photo after all. I always thought April was the cruelest month-guess I thought wrong. Sorry things haven't been so pleasant for you. Magazine people must feel they have carte-blanche to operate however they want. Well, I guess I can understand gathering more material than you use, but it isn't fair to impose a deadline and then drop you off a cliff.